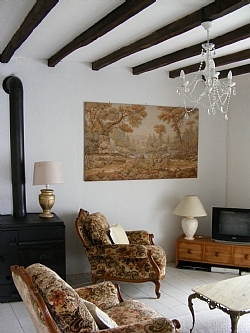 La Brionniere is a French farmhouse which is suitable for families or parties of adults. 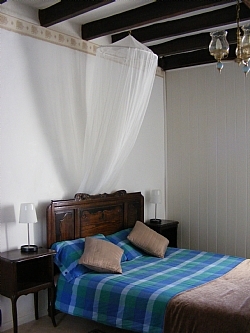 The property sleeps 6, has 3 spacious bedrooms one en-suite. 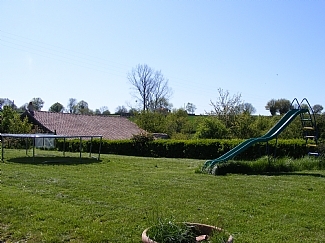 The lounge has a TV, UK digital box, DVD, WIFI, books and games, it leads on to a terrace with gorgeous views.The kitchen/dining has all mod cons and overlooks the lawn, pool and safe play area.The farmhouse is in a small hamlet of 5 houses. On the land are fruit trees, peach, cherry, pears etc, nut trees, grape vines and organic vegetables which you are welcome to eat when in season. There are shady retreats to lounge about or areas to bake in the sun, BBQ's for your use, and out door eating areas. On the door step there are lovely walks, stunning views, woodland, lakes, country lanes, cycle lanes, wild life, farm animals, birds, amazing starry skies and if you are lucky shooting stars. 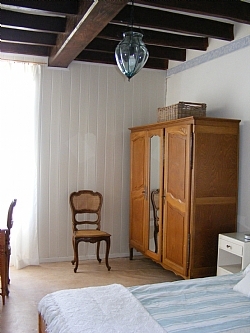 This self catering accommodation sleeps 6 comfortably and retains original features such as beamed ceilings. 1 Twin bedroom (4m x 4m). If required a cot can be supplied. All bedrooms have a large mirrored wardrobe, dresser, chair, power points, bed linen, towels and hairdriers. Kitchen /diner, Kitchen has all mod cons, cooker, dishwasher, fridge freezer, microwave. Also a recycling area. The kitchen overlooks the large garden and pool. The ensuite bedroom has wheelchair space and a sliding door into the wetroom. We can provide a chair for the shower and a fold up wheelchair which fits into a car boot. There is however 3 steps at the front of the property. There are no major roads next to the property the country roads around are quite quiet. The grounds cover 3 and a half acres there is a 15ft diameter plunge pool for your use only, the steps are removable for added security. Children's slide, trampoline, pool table in the barn. Outside table and chairs plus BBQ facilities in a few areas. Additional undercover seating area with bamboo garden suite, loungers and garden swing plus toys for small children. There are shady areas, fruit trees, nut trees, organic veggie garden, running brook, frog pond, ancient trees. Parking and places to lock up bikes if you bring them. 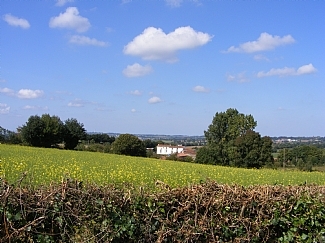 There are beautiful country walks and 3 small lakes nearby. Free tennis courts 10 mins outside the hamlet, a zip line adventure park and go carts. An open barn overlooks the lawn/pool and can be a refuge from the sun while still being outside. It has relaxing garden furniture, plus a swing seat, a table and six chairs, BBQ facilities and some outdoor toys for young children. 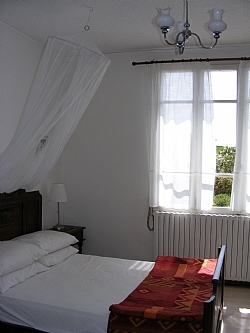 Hire of Bed linen and house towels included - please bring pool/beach towels with you. Pets welcome, but not on the furniture please. restaurant, and pharmacy, church, and cash dispenser. Approx 1 hour drive (though visitors seem to do it quicker) to 250km of beauitful sandy beaches and lovely islands. La Rochelle is popular, it has the beach, harbour, trendy shops, ancient town, cafés etc, La Tranche sur Mer is a great family beach with life guards. There are numerous water sports, cafes, restaurants and shops in the little villages and towns hugging the coast line. Great day out for the family and romantic evenings watching the sun set. There is just so much to do in the Vendee, that you are spoilt for choice - More information on Vendee beaches, activities, attractions etc can be found at the top of this page in the links box to the right. Golf, bird watching, fishing, cycling, go carting, horse riding, rambling, tennis, swimming, theme parks, adventure parks, forest walks, water sports, wind surfing, wine touring, yogo, sailing, sea excursions, shopping, or just sitting drinking a glass of French wine or a coffee in a cafe and watching the world go by. Sightseeing, there are numerous castles and medieval towns in the area. The larger towns have traditional weekly markets with a variety of stalls, many selling local produce. Easy access to the West coast beaches. The area boasts the picturesque forests of Mervent, set in the forest is Park (Pierre Bruin) a great day out for the children. 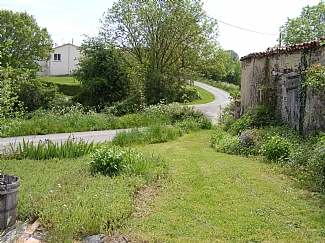 Vouvant and the beautiful Marais Poitevin with its canals, waterways and abundant restaurants. Golf & fishing are popular activities in this area, with golf courses at La Rochelle & Niort and Fishing at the internationally known Pescalis Fishing & Nature centre. It was just what we wanted, a rural setting. thanks for letting the kids dig up the potatoes it's good for them to see where they come from. It's so good for cycling, the roads are great no pot holes and hardly any traffic, amazing.